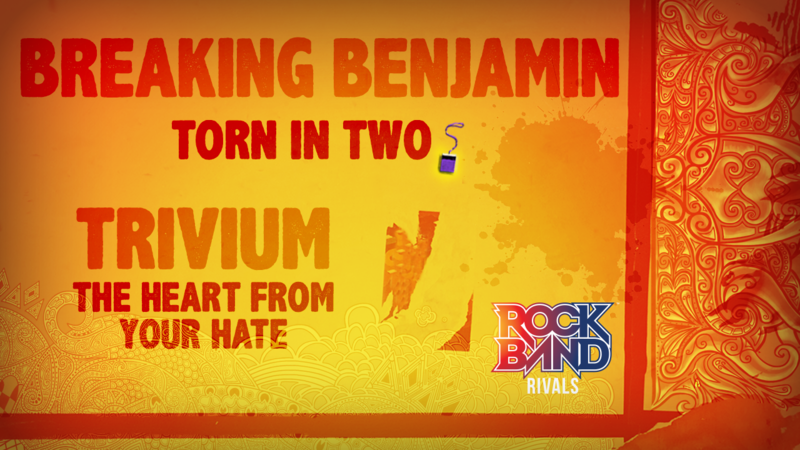 Harmonix Blog: DLC Week of 4/12: Breaking Benjamin and Trivium! DLC Week of 4/12: Breaking Benjamin and Trivium! This week features some great heavy rock, including the debut of Breaking Benjamin’s newest single! To lead the week, we've got the BRAND NEW track "Torn In Two" from Breaking Benjamin, out with their new album Ember this Friday, April 13th. Breaking Benjamin has seen plenty of success throughout their career, with three platinum records and multiple platinum singles. Ember is poised to be another hit for the band, and with songs like "Torn In Two" supporting it, it's easy to see why. A heavy riff through "Torn In Two" and harmonies as excellent as you'd expect from a Breaking Benjamin song make the song tons of fun to play, perfectly fitting in Rock Band. Ember promises to be heavier than previous releases, which should be a treat for Breaking Benjamin fans and newcomers alike. To top it off, inspired fans can check out Breaking Benjamin live on their US tour, kicking off in Seattle on July 16th. For more information about the album and tour visit Breaking Benjamin's website. We've also got "The Heart From Your Hate" this week, off of Trivium's latest album The Sin and the Sentence. Reaching #1 on Billboard's Top Hard Rock Albums upon release, The Sin and the Sentence received critical acclaim for being an excellent combination of all Trivium's talents, with songs like "The Heart From Your Hate" cited as album highlights. A great mix of heavy and melodic, “The Heart From Your Hate” flows back and forth on each instrument. The lead guitar line turns into a slow melody in the verse and then chugging chords in the pre-chorus. Drums lean heavily on the bass pedal during the chorus and back off during verses. At the outro, harmonies split into unique backing lines. Songs can be purchased individually for $1.99 each. The Rock Band Rivals Season 5 Spotlight Pass can be purchased for $13.49. Trivium - "The Heart From Your Hate"
VIDEO: Rock Band 4 DLC Week of 4/12: Breaking Benjamin and Trivium! * Please note that this week’s DLC tracks will be available for purchase on Thursday, April 12th.